Traumatic injury can occur at any time. It can happen to anyone. Those with critical injuries need to receive definitive care within a short period of time in order to minimize the risk of death and disability. The role of a trauma system is to organize resources and assure their immediate availability to the injured at all times and in all geographic areas of the system. These resources include 911 emergency communications centers, basic and advanced prehospital providers, multidisciplinary trauma teams in hospital emergency departments, and in-hospital resources such as operating rooms and intensive care units. Research has shown that the coordination of these resources which takes place as a trauma system develops can result in dramatic reductions, up to 50 percent, in preventable deaths due to injury (Mann NC, Mullins RJ, MacKenzie EJ, et al. Systematic review of published evidence regarding trauma system effectiveness. J Trauma. 1999;47(3 suppl):S25-S33). 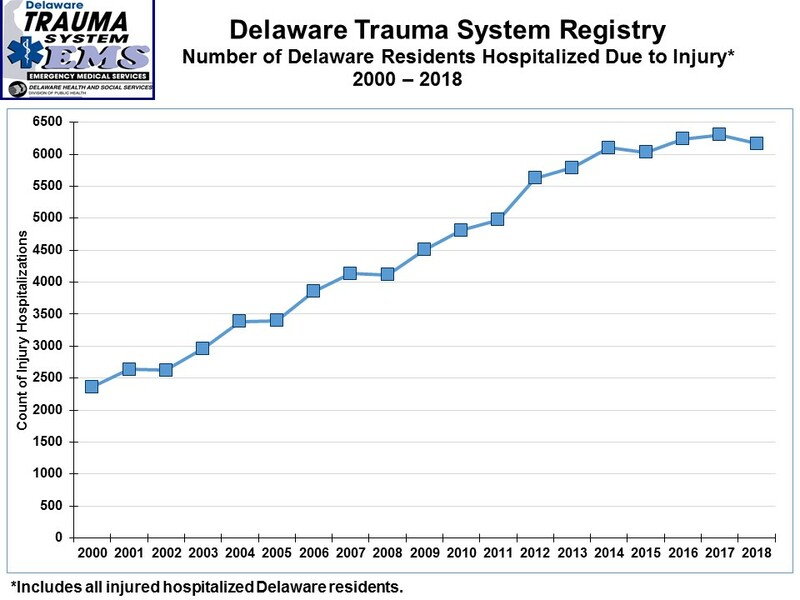 As seen in the graph above, the number of Delaware residents injured seriously enough to require hospitalization continues to rise in Delaware. Our trauma system is caring for more patients each year. More resources are needed to maintain the same level of optimal care for the rising number of injured in our state. June 30, 2016 marked the 20th anniversary of the passage of legislation creating Delaware's statewide trauma system. The passage of this enabling legislation was the first step in systematically improving the care provided to the injured of our state. 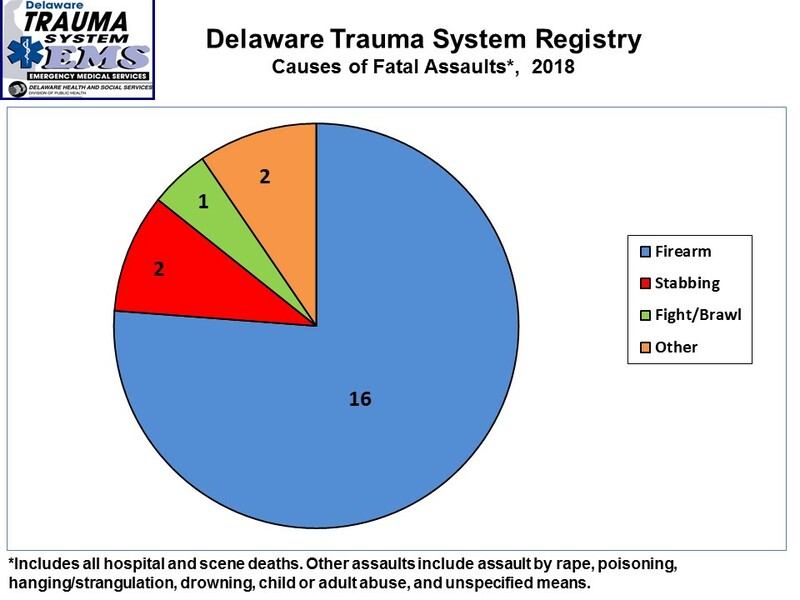 Today's Delaware Trauma System is comprised of a network of professionals who work together to ensure that trauma pa-tients receive the appropriate emergency medical care for their injuries. The success of the statewide trauma system is the result of much hard work by many people and agencies, led by the Division of Public Health (DPH) Office of Emergency Medical Services (OEMS). OEMS is the lead agency and provides oversight of the trauma system, from the time a traumatic incident occurs through the full continuum of care. 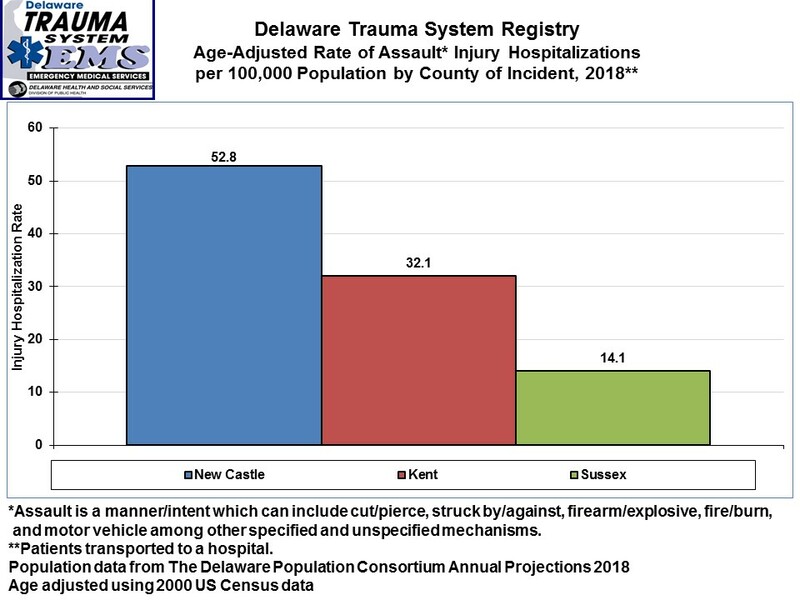 With the guidance of OEMS and the dedication of many individuals statewide, Delaware has developed one of the nation's few truly inclusive statewide trauma systems, in which every acute care hospital participates in the trauma system and has met the standards for state designation as a trauma center or trauma system participating hospital. Most importantly, this means that no matter where in the state people are injured, they enter a system of care that follows the same guidelines, regulations, and standards and makes sure they are cared for in the facility best able to manage their injuries. Since July 1996, over 101,000 people have been cared for by Delaware's Trauma System. As shown below, the mortality rate of all injured patients has dramatically decreased as our trauma system has matured. Comparison is made to national data. Unintentional injuries include those caused by highway crashes involving motor vehicles, bicycles or pedestrians, by falls, and by farm and industrial mishaps. Intentional injury adds assaults, shootings, stabbings, and suicides to the above statistics. 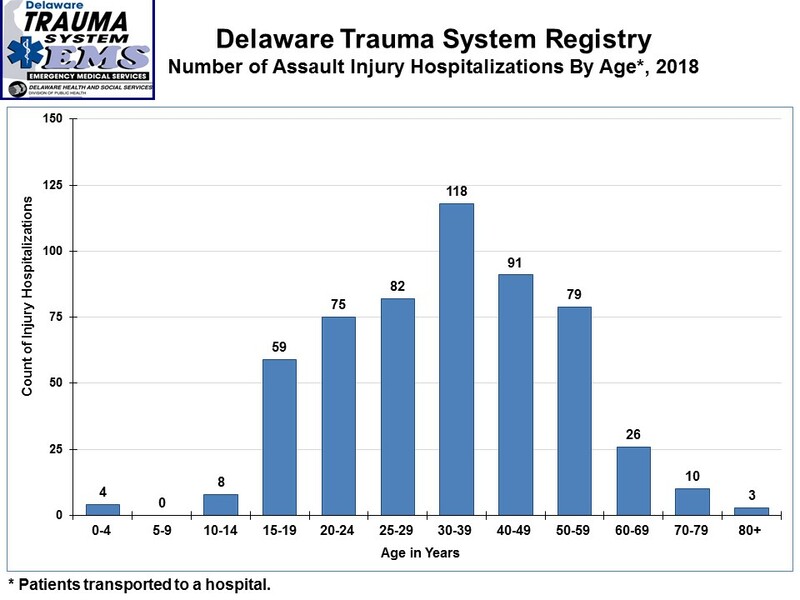 Delaware Trauma System registry records show that 7,905 citizens and visitors were injured seriously enough to require hospitalization in Delaware hospitals in 2015, and of these, 361 sustained fatal injuries. Because trauma so often involves children and young people, it is responsible for the loss of more years of life than any other cause of death, both nationally and in Delaware. It robs us of our most precious resource--our youth. Delaware's Trauma System regulations are based on the guidelines of the American College of Surgeons' Committee on Trauma (ACS COT). ACS review teams visit each Level 1, 2, and 3 trauma center and report to the Division of Public Health on the facility's compliance with the trauma center standards before a hospital can be designated as a Delaware Trauma Center. Reviews must be successfully completed every three years in order for a hospital to retain its state trauma center designation status. Trauma system participating hospitals are reviewed every three years by an out-of-state physician consultant and Division of Public Health staff. A Regional Resource Trauma Center has the capability of providing System leadership and comprehensive, definitive care for every aspect of injury from prevention through rehabilitation. A Pediatric Regional Resource Trauma Center has the capability of providing comprehensive, definitive pediatric trauma care for the most severely injured children within its geographic area. It assumes a leadership role in the care for injured children within its Trauma System. A Community Trauma Center is capable of providing assessment, resuscitation, stabilization, and triage for all trauma patients, arranging for timely transfer of those patients requiring the additional resources of a Regional Trauma or Specialty Center, and delivering definitive care to those whose needs match the resources of this facility. Reciprocity means that Delaware's Division of Public Health has accepted the trauma center designation conferred by Maryland. 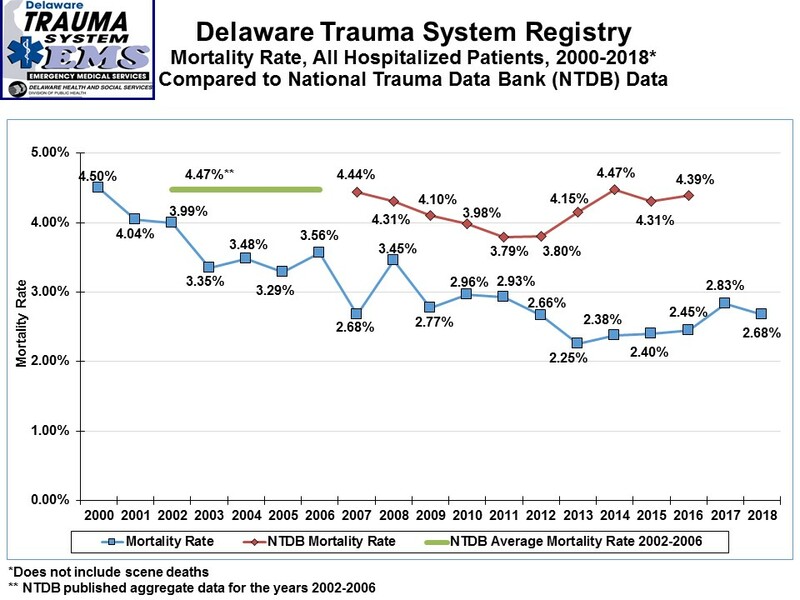 Data submitted by all eight Delaware acute care hospitals is compiled into the Delaware Trauma System Registry. Hospital trauma registrars gather data from prehospital tripsheets and hospital medical records to enter into the trauma registry software program. They submit data on a quarterly basis to the OEMS Trauma System Coordinator. System reports are then generated on various topics, including types, locations, and persons involved in trauma occurring throughout the state, as well as trauma system quality parameters. Trauma in the elderly is a significant health problem. Injuries are a leading cause of hospitalization, long-term care placement, and death in the elderly. As shown in this graph, falls are the number one cause of injury in the elderly by far. 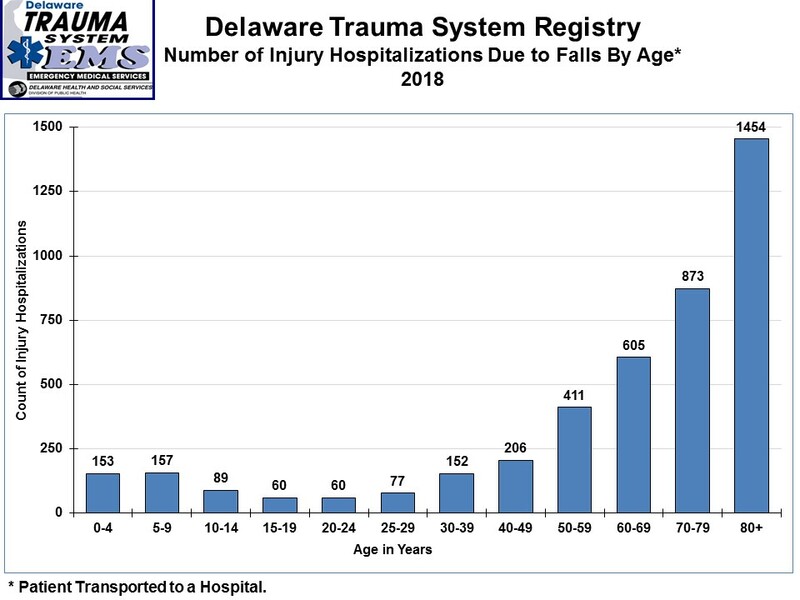 The following graph shows the age distribution of fall injuries seen in Delaware Trauma System hospitals. 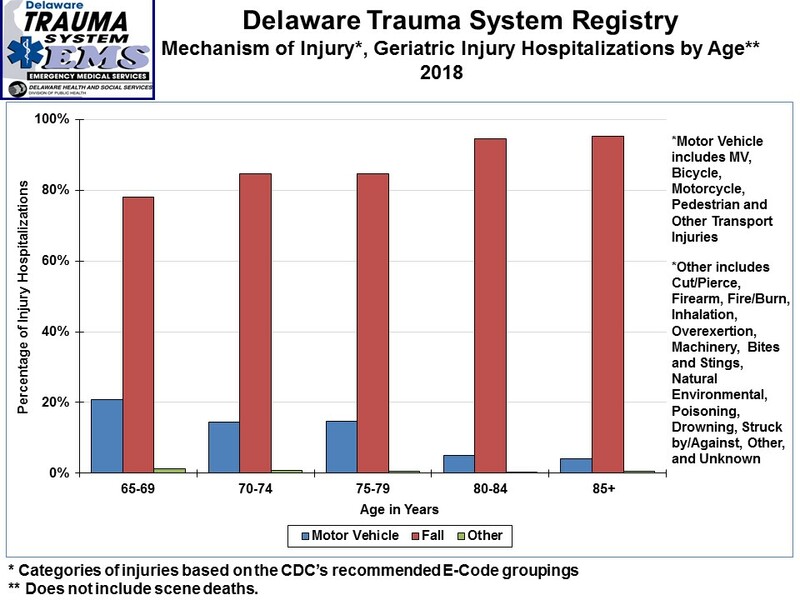 Despite the high incidence of fall injuries, the mortality rate for seriously injured seniors has decreased in Delaware. 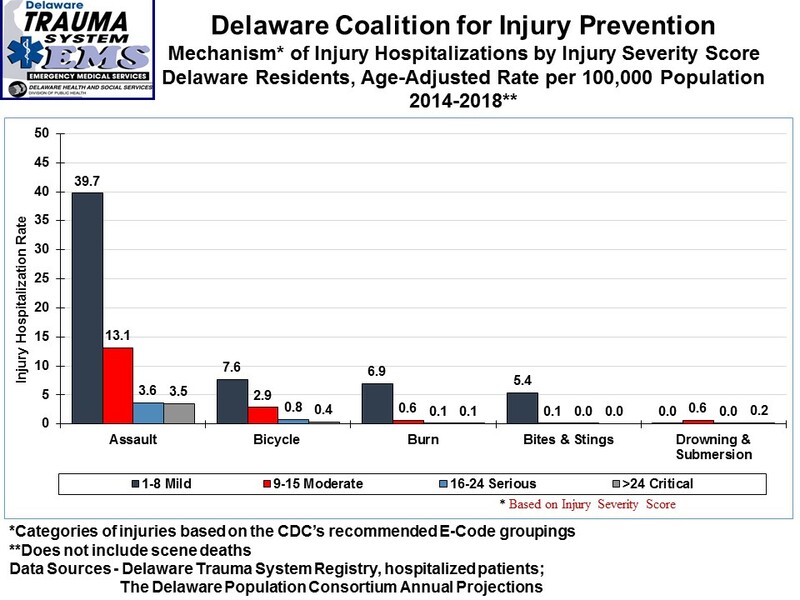 Violent injuries are also a problem in Delaware. The graph below illustrates the breakdown by scene location on assaults that caused injuries requiring hospitalization, adjusted by population. This graph provides the age breakdown for hospitalized assault patients. 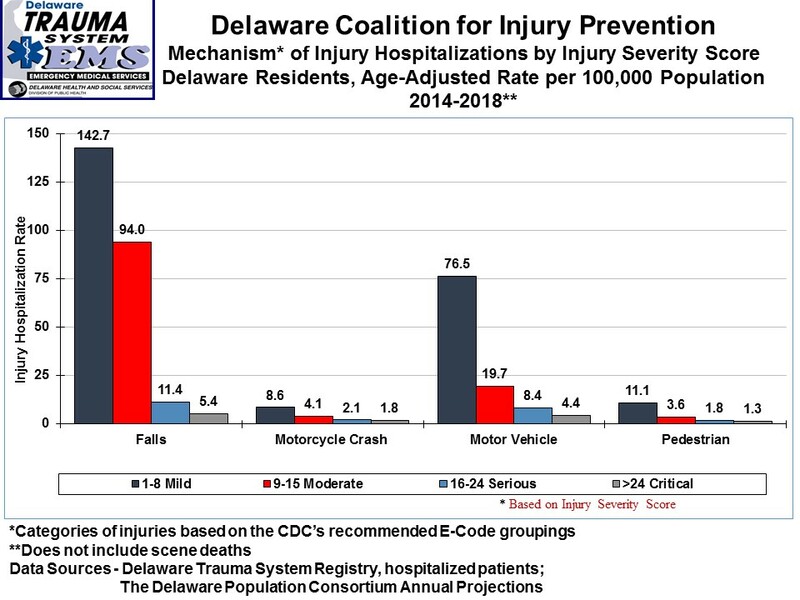 The next table shows data related to Delaware injury hospitalizations. 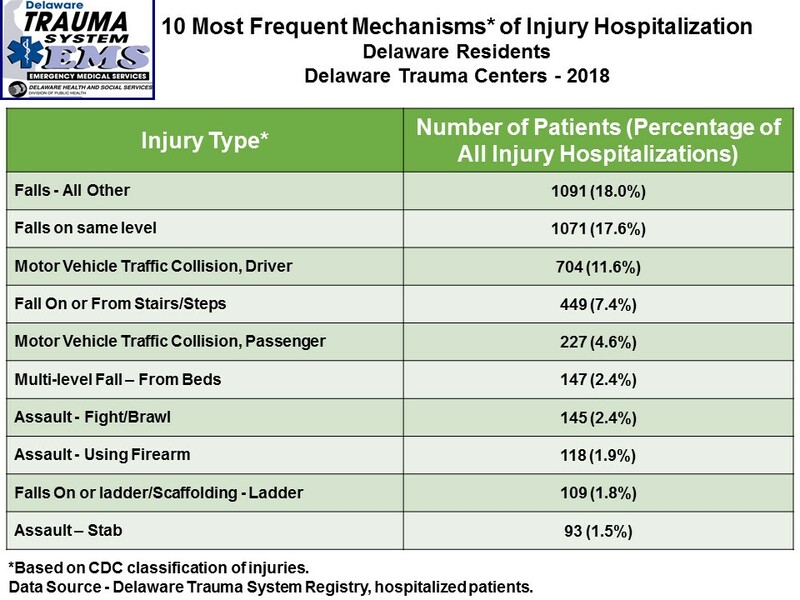 Falls, highway, and assault-related injuries make up over 59 percent of all injury-related hospitalizations in Delaware Trauma System hospitals. Falls cause the highest number of Intensive Care Unit stays for all age groups. And falls are responsible for the most serious and critical injuries among Delaware residents. 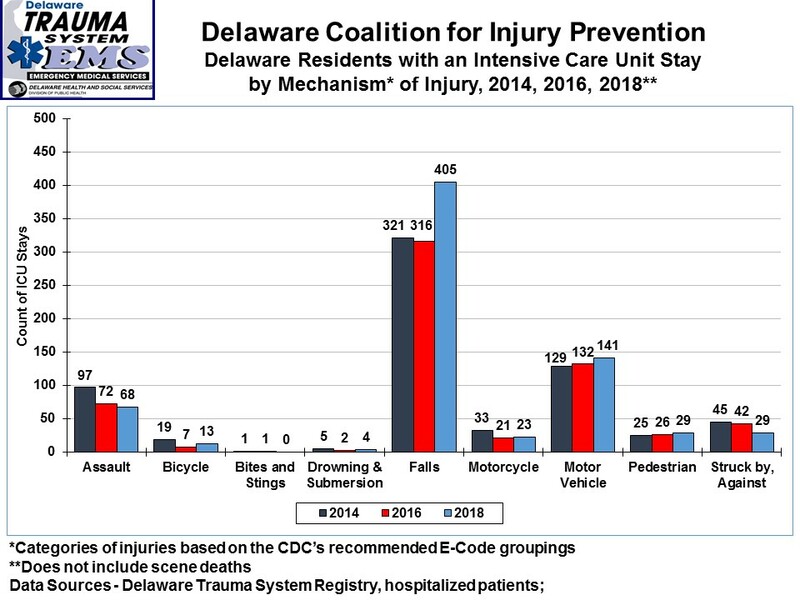 The Delaware Coalition for Injury Prevention is working to decrease injury-related death and disability. Please visit their pages using this link.